Paralinguistics — the study of non-verbal means of communication (gestures, facial expressions, eye-contact, etc.). 2 A nonce-word is a word coined for one occasion, a situational neologism: (for the) nones — by misdivision from ME (for then) ones. whole. The units of a vocabulary or lexical units are two-facet elements possessing form and meaning. The basic unit forming the bulk of the vocabulary is the word. Other units are morphemes that is parts of words, into which words may be analysed, and set expressions or groups of words into which words may be combined. Words are the central elements of language system, they face both ways: they are the biggest units of morphology and the smallest of syntax", and what is more, they embody the main structural properties and functions of the language. Words can be separated in an utterance by other such units and can be used in isolation. Unlike words, morphemes cannot be divided into smaller meaningful units and are functioning in speech only as constituent parts of words. Words are thought of as representing integer concept, feeling or action or as having a single referent. The meaning of morphemes is more abstract and more general than that of words and at the same time they are less autonomous. Set expressions are word groups consisting of two or more words whose combination is integrated so that they are introduced in speech, so to say, ready-made as units with a specialised meaning of the whole that is not understood as a mere sum total of the meanings of the elements. In the spelling system of the language words are the smallest units of written discourse: they are marked off by solid spelling. The ability of an average speaker to segment any utterance into words is sustained by literacy. Yet it is a capacity only reinforced by education: it is well known that every speaker of any language is always able to break any utterance into words. The famous American linguist E. Sapir testified that even illiterate American Indians were perfectly capable of dictating to him — when asked to do so — texts in their own language “word by word”. The segmentation of a word into morphemes, on the other hand, presents sometimes difficulties even for trained linguists. Many authors devoted a good deal of space to discussing which of the two: the word or the morpheme is to be regarded as the basic unit. Many American linguists (Ch. Hockett or Z. Harris, for instance) segmented an utterance into morphemes ignoring words. Soviet lexicologists proceed from the assumption that it is the word that is the basic unit, especially as all branches of linguistic knowledge and all levels of language have the word as their focal point. A convincing argumentation and an exhaustive review of literature is offered by A. A. Ufimtseva (1980). If, however, we look now a little more closely into this problem, we shall see that the boundaries separating these three sets of units are sometimes fluid. Every living vocabulary is constantly changing adapting itself to the functions of communication in the changing world of those who use it. In this process the vocabulary changes not only quantitatively by creating new words from the already available corpus of morphemes and according to existing patterns but also qualitatively. In these qualitative changes new morphemic material and new word-building patterns come into being, and new names sometimes adapt features characteristic of other sets, those of groups of words, for instance. Orthographic words are written as a sequence of letters bounded by spaces on a page. Yet, there exist in the English vocabulary lexical units that are not identical with orthographic words but equivalent to them. Almost any part of speech contains units indivisible either syntactically or in terms of meaning, or both, but graphically divided. A good example is furnished by complex prepositions: along with, as far as, in spite of, except for, due to, by means of, for the sake of, etc. The same point may be illustrated by phrasal verbs, so numerous in English: bring up ‘to educate’, call on ‘to visit’, make up ‘to apply cosmetics’, ‘to reconcile after a disagreement’ and some other meanings, put off “to postpone’. The semantic unity of these verbs is manifest in the possibility to substitute them by orthographically single-word verbs. Though formally broken up, they function like words and they are integrated semantically so that their meaning cannot be inferred from their constituent elements. The same is true about phrasal verbs consisting of the verbs give, make, take and some others used with a noun instead of its homonymous verb alone: give a smile, make a promise, take a walk (cf. to smile, to promise, to walk). Some further examples are furnished by compound nouns. Sometimes they are not joined by solid spelling or hyphenation but written separately, although in all other respects they do not differ from similar one-word nominations. By way of example let us take some terms for military ranks. The terms lieutenant-commander and lieutenant-colonel are hyphenated, whereas wing commander and flight lieutenant are written separately. Compare also such inconsistencies as all right and altogether, never mind and nevertheless. All these are, if not words, then at least word equivalents because they are indivisible and fulfil the nominative, significative, communicative and pragmatic functions just as words do. It is worth while dwelling for a moment on formulaic sentences which tend to be ready-made and are characterised by semantic unity and indivisibility: All right, Allow me, Nothing doing, Never mind, How do you do, Quite the contrary. They are learned as unanalysable wholes and can also be regarded as word equivalents. It has been claimed by different authors that, in contrast to grammar, the vocabulary of a language is not systematic but chaotic. In the light of recent investigations in linguistic theory, however, we are now in a position to bring some order into this “chaos”. Lexicology studies the recurrent patterns of semantic relationships, and of any formal phonological, morphological or contextual means by which they may be rendered. It aims at systematisation. There has been much discussion of late, both in this country and abroad, concerning different problems of the systematic nature of the language vocabulary. The Soviet scholars are now approaching a satisfactory solution based on Marxist dialectics and its teaching of the general interrelation and interdependence of phenomena in nature and society. There are several important points to be made here. The term system as used in present-day lexicology denotes not merely the sum total of English words, it denotes a set of elements associated and functioning together according to certain laws. It is a coherent homogeneous whole, constituted by interdependent elements of the same order related in certain specific ways. The vocabulary of a language is moreover an adaptive system constantly adjusting itself to the changing requirements and conditions of human communications and cultural surroundings. It is continually developing by overcoming contradictions between its state and the new tasks and demands it has to meet. A set is described in the abstract set theory as a collection of definite distinct objects to be conceived as a whole. A set is said to be a collection of distinct elements, because a certain object may be distinguished from the other elements in a set, but there is no possibility of its repeated appearance. A set is called structured when the number of its elements is greater than the number of rules according to which these elements may be constructed. A set is given either by indicating, i.e. listing, all its elements, or by stating the characteristic property of its elements. For example the closed set of English articles may be defined as comprising the elements: the, a/an and zero. The set of English compounds on the other hand is an infinite (open) set containing all the words consisting of at least two stems which occur in the language as free forms. In a classical set theory the elements are said to be definite because with respect to any of them it should be definite whether it belongs to a given set or not. 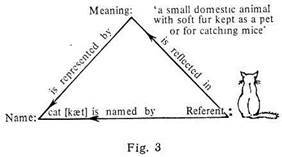 The new development in the set theory, that of fuzzy sets, has proved to be more relevant to the study of vocabulary. We have already mentioned that the boundaries of linguistic sets are not sharply delineated and the sets themselves overlapping. 1 Another term often used nowadays and offered by V.G. Admoni is field-structure. The lexical system of every epoch contains productive elements typical of this particular period, others that are obsolete and dropping out of usage, and, finally, some new phenomena, significant marks of new trends for the epochs to come. The present status of a system is an abstraction, a sort of scientific fiction which in some points can facilitate linguistic study, but the actual system of the language is in a state of constant change. Lexicology studies this whole by determining the properties of its elements and the different relationships of contrast and similarity existing between them within a language, as well as the ways in which they are influenced by extra-linguistic reality. The extra-linguistic relationships refer to the connections of words with the elements of objective reality they serve to denote, and their dependence on the social, mental and cultural development of the language community. The reflection of objective reality is selective. That is, human thought and language select, reflect and nominate what is relevant to human activity. In terms of oppositions, differences, equivalencies and positional values. Equivalence should be clearly distinguished from equality or identity. Equivalence is the relation between two elements based on the common feature due to which they belong to the same set. The term sуstem as applied to vocabulary should not be understood to mean a well-defined or rigid system. As it has been stated above it is an adaptive system and cannot be completely and exactly characterised by deterministic functions; that is for the present state of science it is not possible to specify the system’s entire future by its status at some one instant of its operation. In other words, the vocabulary is not simply a probabilistic system but a set of interrelated adaptive subsystems. An approximation is always made possible by leaving some things out of account. But we have to remember that the rules of language are mostly analogies. At this point it will be helpful to remember that it is precisely the most frequent words that show irregular or suppletive derivation and inflection. Last but not least, one final point may be made about the lexical system, namely that its elements are characterised by their combinatorial and contrastive properties determining their syntagmatic and paradigmatic relationships. A word enters into syntagmatic (linear) combinatorial relationships with other lexical units that can form its context, serving to identify and distinguish its meaning. Lexical units are known to be context-dependent. E. g. in the hat on her head the noun head means ‘part of the body’, whereas in the head of the department Head means ‘chief. A word enters into contrastive paradigmatic relations with all other words, e. g. head, chief, director, etc. that can occur in the same context and be contrasted to it.1 This principle of contrast or opposition is fundamental in modern linguistics and we shall deal with it at length in § 1.6. concerned with the theory of oppositions. Paradigmatic and syntagmatic studies of meaning are functional because the meaning of the lexical unit is studied first not through its relation to referent but through its functions in relation to other units. Functional approach is contrasted to referential or onomasiological approach, otherwise called theory of nomination, in which meaning is studied as the interdependence between words and their referents, that is things or concepts they name, i.e. various names given to the same sense. The onomasiological study of lexical units became especially prominent in the last two decades. The revival of interest in onomasiological matters is reflected in a large volume of publications on the subject. An outline of the main trends of current research will be found in the monographs on the Theory of Nomination issued by the Institute of Linguistics of the Academy of Sciences. The study of the lexical system must also include the study of the words’ combinatorial possibilities •— their capacity to combine with one another in groups of certain patterns, which serve to identify meanings. Most modern research in linguistics attaches great importance to what is variously called valency, distributional characteristics, colligation and collocation, combining power or otherwise. This research shows that combinatorial possibilities of words play an important part in almost every lexicological issue. Syntagmatic relationships being based on the linear character of speech are studied by means of contextual, valency, distributional, transformational and some other types of analysis. Paradigmatic linguistic relationships determining the vocabulary system are based on the interdependence of words within the vocabulary (synonymy, antonymy, hyponymy, etc.). Diachronically the interdependence of words within the lexical subsystem may be seen by observing shifts in the meaning of existing words that occur when a new word is introduced into their semantic sphere. This interdependence is one of the reasons why historical linguistics can never achieve any valuable results if it observes only the development of isolated words. Almost any change in one word will cause changes in one or several other words. Characteristic examples are to be found in the influence of borrowings upon native words. The native OE haerfest (ModE harvest || Germ Herbst) originally meant not only the gathering of grain’ but also ‘the season for reaping’. Beginning with the end of the 14th century, that is after the Romance word autumne > autumn was borrowed, the second meaning in the native word was lost and transferred to the word autumn. When speaking about the influence of other aspects on the development of the vocabulary, we mean the phonetical, morphological and syntactical systems of the English language as they condition the sound form, morphological structure, motivation and meaning of words. This influence is manifold, and we shall have to limit our illustration to the most elementary examples. The monosyllabic phonological type of the English word, for instance, enhances homonymy. Сf. miss v ‘not hit’, ‘not catch’ and miss n — a title for a girl or unmarried woman. The influence of morphology is manifest, for instance, in the development of non-affixed word-formation. Cf. harvest n and harvest v.
The above considerations are not meant to be exhaustive; they are there to give some general idea of the relationships in question. In this connection it is necessary to point out that various interpretations of the same linguistic phenomena have repeatedly been offered and have even proved valuable for their respective purposes, just as in other sciences various interpretations may be given for the same facts of reality in conformity with this or that practical task. To be scientific, however, these interpretations cannot be arbitrary: they must explain facts and permit explanation and prediction of other facts. Therefore they must fit without bringing contradictions into the whole system of the theory created for the subject. This course of English lexicology falls into two main parts: the treatment of the English word as a structure and the treatment of English vocabulary as a system. The aim of the present book is to show this system of interdependent elements with specific peculiarities of its own, different from other lexical systems; to show the morphological and semantic patterns according to which the elements of this system are built, to point out the distinctive features with which the main oppositions, i.e. semantically and functionally relevant partial differences between partially similar elements of the vocabulary, can be systematised, and to try and explain how these vocabulary patterns are conditioned by the structure of the language. The theory of oppositions is the task to which we address ourselves in this paragraph. Lexical opposition is the basis of lexical research and description. Lexicological theory and lexicological description cannot progress independently. They are brought together in the same general technique of analysis, one of the cornerstones of which is N.S. Trubetzkoy’s theory of oppositions. First used in phonology, the theory proved fruitful for other branches of linguistics as well. Modern linguistics views the language system as consisting of several subsystems all based on oppositions, differences, samenesses and positional values. A lexical opposition is defined as a semantically relevant relationship of partial difference between two partially similar words. different linguistic levels: in phonology, morphology, lexicology. We deal with lexical distinctive features and lexical oppositions. Thus, in the opposition doubt : : doubtful the distinctive features are morphological: doubt is a root word and a noun, doubtful is a derived adjective. The features that the two contrasted words possess in common form the basis of a lexical opposition. The basis in the opposition doubt :: doubtful is the common root -doubt-. The basis of the opposition may also form the basis of equivalence due to which these words, as it has been stated above, may be referred to the same subset. The features must be chosen so as to show whether any element we may come across belongs to the given set or not.1 They must also be important, so that the presence of a distinctive feature must allow the prediction of secondary features connected with it. The feature may be constant or variable, or the basis may be formed by a combination of constant and variable features, as in the case of the following group: pool, pond, lake, sea, ocean with its variation for size. Without a basis of similarity no comparison and no opposition are possible. When the basis is not limited to the members of one opposition but comprises other elements of the system, we call the opposition polydimensional. The presence of the same basis or combination of features in several words permits their grouping into a subset of the vocabulary system. We shall therefore use the term lexical group to denote a subset of the vocabulary, all the elements of which possess a particular feature forming the basis of the opposition. Every element of a subset of the vocabulary is also an element of the vocabulary as a whole. It has become customary to denote oppositions by the signs: ---- , ÷or ::, e. g.
In the opposition man :: boy the distinctive feature is the semantic component of age. In the opposition boy :: lad the distinctive feature is that of stylistic colouring of the second member. The methods and procedures of lexical research such as contextual analysis, componential analysis, distributional analysis, etc. will be briefly outlined in other chapters of the book. 1 One must be careful, nevertheless, not to make linguistic categories more rigid and absolute than they really are. There is certainly a degree of “fuzziness” about many types of linguistic sets. Although the borderline between various linguistic units is not always sharp and clear, we shall try to define every new term on its first appearance at once simply and unambiguously, if not always very rigorously. The approximate definition of the term word has already been given in the opening page of the book. The important point to remember about definitions is that they should indicate the most essential characteristic features of the notion expressed by the term under discussion, the features by which this notion is distinguished from other similar notions. For instance, in defining the word one must distinguish it from other linguistic units, such as the phoneme, the morpheme, or the word-group. In contrast with a definition, a description aims at enumerating all the essential features of a notion. To make things easier we shall begin by a preliminary description, illustrating it with some examples. The word may be described as the basic unit of language. Uniting meaning and form, it is composed of one or more morphemes, each consisting of one or more spoken sounds or their written representation. Morphemes as we have already said are also meaningful units but they cannot be used independently, they are always parts of words whereas words can be used as a complete utterance (e. g. Listen!). The combinations of morphemes within words are subject to certain linking conditions. When a derivational affix is added a new word is formed, thus, listen and listener are different words. In fulfilling different grammatical functions words may take functional affixes: listen and listened are different forms of the same word. Different forms of the same word can be also built analytically with the help of auxiliaries. E.g. : The world should listen then as I am listening now (Shelley). simplest word has many different aspects. It has a sound form because it is a certain arrangement of phonemes; it has its morphological structure, being also a certain arrangement of morphemes; when used in actual speech, it may occur in different word forms, different syntactic functions and signal various meanings. Being the central element of any language system, the word is a sort of focus for the problems of phonology, lexicology, syntax, morphology and also for some other sciences that have to deal with language and speech, such as philosophy and psychology, and probably quite a few other branches of knowledge. All attempts to characterise the word are necessarily specific for each domain of science and are therefore considered one-sided by the representatives of all the other domains and criticised for incompleteness. The variants of definitions were so numerous that some authors (A. Rossetti, D.N. Shmelev) collecting them produced works of impressive scope and bulk. Thomas Hobbes (1588-1679), one of the great English philosophers, revealed a materialistic approach to the problem of nomination when he wrote that words are not mere sounds but names of matter. Three centuries later the great Russian physiologist I.P. Pavlov (1849-1936) examined the word in connection with his studies of the second signal system, and defined it as a universal signal that can substitute any other signal from the environment in evoking a response in a human organism. One of the latest developments of science and engineering is machine translation. It also deals with words and requires a rigorous definition for them. It runs as follows: a word is a sequence of graphemes which can occur between spaces, or the representation of such a sequence on morphemic level. It has been syntactically defined for instance as “the minimum sentence” by H. Sweet and much later by L. Bloomfield as “a minimum free form”. This last definition, although structural in orientation, may be said to be, to a certain degree, equivalent to Sweet’s, as practically it amounts to the same thing: free forms are later defined as “forms which occur as sentences”. Altogether is one word according to its spelling, but how is one to treat all right, which is rather a similar combination? 1 Sapir E. Language. An Introduction to the Study of Speech. London, 1921, P. 35. 2 Lyons, John. Introduction to Theoretical Linguistics. Cambridge: Univ. Press, 1969. P. 203. 3 Ullmann St. The Principles of Semantics. Glasgow, 1957. P. 30. 4 Gardiner A.H. The Definition of the Word and the Sentence // The British Journal of Psychology. 1922. XII. P. 355 (quoted from: Ullmann St., Op. cit., P. 51). This definition does not permit us to distinguish words from phrases because not only child, but a pretty child as well are combinations of a particular group of sounds with a particular meaning capable of a particular grammatical employment. We can, nevertheless, accept this formula with some modifications, adding that a word is the smallest significant unit of a given language capable of functioning alone and characterised by positional mobility within a sentence, morphological uninterruptability and semantic integrity.2 All these criteria are necessary because they permit us to create a basis for the oppositions between the word and the phrase, the word and the phoneme, and the word and the morpheme: their common feature is that they are all units of the language, their difference lies in the fact that the phoneme is not significant, and a morpheme cannot be used as a complete utterance. Another reason for this supplement is the widespread scepticism concerning the subject. It has even become a debatable point whether a word is a linguistic unit and not an arbitrary segment of speech. This opinion is put forth by S. Potter, who writes that “unlike a phoneme or a syllable, a word is not a linguistic unit at all. "3 He calls it a conventional and arbitrary segment of utterance, and finally adopts the already mentioned definition of L. Bloomfield. This position is, however, as we have already mentioned, untenable, and in fact S. Potter himself makes ample use of the word as a unit in his linguistic analysis. The weak point of all the above definitions is that they do not establish the relationship between language and thought, which is formulated if we treat the word as a dialectical unity of form and content, in which the form is the spoken or written expression which calls up a specific meaning, whereas the content is the meaning rendering the emotion or the concept in the mind of the speaker which he intends to convey to his listener. Summing up our review of different definitions, we come to the conclusion that they are bound to be strongly dependent upon the line of approach, the aim the scholar has in view. For a comprehensive word theory, therefore, a description seems more appropriate than a definition. 1 Meillet A. Linguistique historique et linguistique generate. Paris, 1926. Vol. I. P. 30. 2 It might be objected that such words as articles, conjunctions and a few other words never occur as sentences, but they are not numerous and could be collected into a list of exceptions. 3 See: Potter S. Modern Linguistics. London, 1957. P. 78.
on this problem and achieved a clear presentation of the word as a basic unit of the language. The main points may now be summarised. The word is the fundamental unit of language. It is a dialectical unity of form and content. Its content or meaning is not identical to notion, but it may reflect human notions, and in this sense may be considered as the form of their existence. Concepts fixed in the meaning of words are formed as generalised and approximately correct reflections of reality, therefore in signifying them words reflect reality in their content. The acoustic aspect of the word serves to name objects of reality, not to reflect them. In this sense the word may be regarded as a sign. This sign, however, is not arbitrary but motivated by the whole process of its development. That is to say, when a word first comes into existence it is built out of the elements already available in the language and according to the existing patterns. The question that now confronts us is this: what is the relation of words to the world of things, events and relations outside of language to which they refer? How is the word connected with its referent? Here, according to F. de Saussure, only the relationship shown by a solid line concerns linguistics and the sign is not a unity of form and meaning as we understand it now, but only sound form. Originally this triangular scheme was suggested by the German mathematician and philosopher Gottlieb Frege (1848-1925). 1 A concept is an idea of some object formed by mentally reflecting and combining its essential characteristics. linguistic than just a concept. This approach may be called referential because it implies that linguistic meaning is connected with the referent. It is graphically shown by there being only one dotted line. A solid line between reference and referent shows that the relationship between them is linguistically relevant, that the nature of what is named influences the meaning. This connection should not be taken too literally, it does not mean that the sound form has to have any similarity with the meaning or the object itself. The connection is conventional. Several generations of writers, following C.K. Ogden and I.A. Richards, have in their turn taken up and modified this diagram. It is known under several names: the semantic triangle, triangle of signification, Frege semiotic triangle, Ogden and Richards basic triangle or simply basic triangle. We reproduce it for the third time to illustrate how it can show the main features of the referential approach in its present form. All the lines are now solid, implying that it is not only the form of the linguistic sign but also its meaning and what it refers to that are relevant for linguistics. The scheme is given as it is applied to the naming of cats. The diagram represents the simplest possible case of reference because the word here is supposed to have only one meaning and one form of fixation. Simplification, is, however, inherent to all models and the popularity of the semantic triangle proves how many authors find it helpful in showing the essence of the referential approach.